Home Remodeling: How Much Can You Save by Doing It Yourself? Eight in 10 U.S. homeowners think that hiring an improvement professional is too expensive, but 68 percent say that the cost is preferable to doing the work themselves. Homeowners who renovate a kitchen, a bedroom, or a recreation room themselves can save more than $20,000. Do it yourself with caution: Almost half of all homeowners have undertaken an improvement project that ended poorly. Nearly half of homebuyers run into unexpected repairs within the first year of ownership, and those who are handy enough to do the work themselves can save enough money to put a dent in their mortgage balance. NerdWallet’s 2018 Home Improvement Report found that 44 percent of Americans who purchased a home needed to fix some aspect of the property in the first year, while an unlucky 12 percent ran into problems within the first month. Almost one-third of those surveyed say that they do not have funds earmarked for home repair and improvement costs, a fact that causes 48 percent of those surveyed to experience anxiety. Remodeling costs are top of mind for homeowners, and 80 percent say that professionals charge too much for materials and labor. Still, more than two-thirds of Americans say that they prefer to pay the pros to handle a renovation project rather than do it themselves. But those homeowners who are willing to get their hands dirty can realize substantial savings — particularly for larger jobs. Americans who have the skills to add or renovate a kitchen, a bedroom, or a recreation room can save more than $20,000 by doing the work themselves. Fourteen of the 15 home-improvement projects that NerdWallet tracks offer DIY savings of at least $1,500, with installing a security system the only one that offers no financial benefit over hiring a pro. Younger Americans who have recently bought their first home are usually more strapped for cash than longer-term owners, as well as more likely to encounter problems within the first year, an event cited by 60 percent of millennials. Because of these factors, younger owners are the most likely to undertake DIY projects — 59 percent of Americans between the ages of 25 and 29 and 55 percent of those under 25. 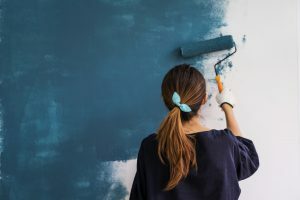 Despite the financial benefits that come with a DIY home-renovation project, owners should not hope to hit a home run every time. Forty-three percent of Americans admit to botching an improvement at some point, and 35 percent were persuaded to tackle the project because of TV shows or video clips.